Masters of Food and Wine is an annual conference of foodies held in Carmel for twenty years – until it moved to Mendoza in 2007. This year’s Masters of Food and Wine made a huge splash in Argentine wine country. The party that kicked off the week of wine, cheese, and culinary delights was held at the Hyatt’s Palacio Duhau in Buenos Aires’ elegant neighborhood of Recoleta. The Malbec, Torrontés & Cheese Tasting was a hit and attracted a great-looking, relaxed crowd of Argentines and visiting guests of the global culinary arts. The elegant spread of cheeses, fruit and fresh baked bread were accessory to the star of the show at the Hyatt – Argentine wines. Four candlelit rooms staffed with wine representatives and chefs in full regalia catered to the whims of guests who made their way through the spread to the back of the Palacio Duhau to the gardens, for further fantastic tastings. 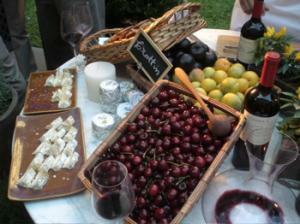 A few foodie stars showed up to the tasting that opened the week’s events in BA and Mendoza. There was the owner and head chef of Nobu, New York City’s premier sushi restaurant famous for its haute fusion cuisine. There was Paul Bocuse, star French chef accompanied by an entourage from his restaurants in Lyon. I spent time with the sommelier of one of Mario Battali’s restaurants in New York’s Greenwich Village. There were members of the press from Wine Spectator, the New York Times, Time Out and Gourmet Magazine. Argentina’s prominent wine families were on hand for the event that is said will help bring Argentina into the forefront of the world’s wine market – where it certainly belongs. Organized by Park Hyatt International, Masters of Wine and Food was a conference spanning a week of events in Buenos Aires and Mendoza. For this first event, Maitre Fromager, Mercedes Silva Rodriguez and sommelier, Marcelo Rebole, of Palacio Duhau – Park Hyatt Buenos Aires selected ten Argentine cheeses and paired them with ten Argentine Malbecs and Torrontés. Representatives were on hand to present each vintage from their respective wineries. The results were a pleasure for the palate and a preview of the week to come.